The damage meter won't be green for long when he slides into those cardboard triangles. Come to think of it, I would rather watch football than play Sno-Cross. Football has strategy and action. Sno-Cross has idiots racing around muddy looking tracks in a contest to see who can hold the acceleration button down the longest. There is nothing to the races with the idiot AI being the game's biggest downfall. I think if you're going to make a racing game, at least make sure that the racers appear to have some knowledge about racing. Computer riders will not race the shortest route, often make wide and unnecessary turns, and frequently crash. Of course, none of that matters since the CPU riders all can afford better equipped snowmobiles than you, even when you're the one earning all the money! That's what makes the championship so frustrating, and the advanced CPU vehicles are just a cheap way to overcome shoddy AI. You'll notice this when you see the pack of four racers (yeah, the game really taxes the Dreamcast) begin on an even line, leaving you far behind within seconds for no reason. Perhaps Crave was hoping to make a Dreamcast Artic Thunder but forgot to include the boost icons. It's a shame this isn't Artic Thunder, because several times I found myself wanting to punch or launch a missile at my opponents. So much as a tap from the CPU riders will send you flying, although they're by and large invincible. It's too easy to crash; I don't see how I can possibly get hit two feet from the starting line and be sent flying into the nearest hill, but it happens in Sno-Cross and does so with a hated frequency. Any kind of jump is also more than likely to send you crashing, more so if you dare to try and pull off an aerial trick. Crashing or colliding with stuff on the track damages your snowmobile, and repairs (both damage and engine maintenance) can get costly fast. In fact, repairs can eat up your earnings so much that there's hardly enough money to properly upgrade your snowmobile to make it competitive with all those other rich racers. The designers have installed a Catch-22 situation in the game where you need to do tricks to afford better stuff but also jeopardize your chances of winning and increase your likelihood of needing repairs by doing them. You only get paid once for each trick as well, so it's not like you can do a bunch of easy tricks to rack up the cash. Oftentimes you'll find that there simply aren't enough high jumps to get through the entire trick roster within a given race. The game also discourages you from conserving money by not letting it or new parts carry over from one championship to the next. You'll never be able to afford to purchase all of the often necessary upgrades, and it doesn't help that the game doesn't tell you what the championship course outlook will be so you could make some attempt to plan ahead. Crave published Genki's Tokyo Xtreme Racer series, so it's not like the company has yet to see a good money system implemented before. Wow. A licensed Yamaha snowmobile. Surely these people know their stuff. 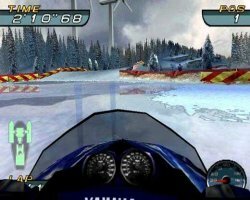 It's funny how people griped about the slowdown in Tokyo Xtreme Racer's two-player mode, because if you thought the framerate, pop-up, and clipping was bad in Sno-Cross' single player mode was sad, well, you're right, but it gets worse. Much, much worse. In a game which by appearances should easily be able to handle a four-player mode, Sno-Cross only supports a crippled two-player mode with more slowdown and framerate stuttering than you can shake a stick under a strobe light at. It's bad and virtually unplayable in the third-person view mode. Switching to the cockpit view helps speed things up a bit, but this should not be necessary. This is just bad programming. It's too bad, too, since the single player mode just isn't fun. Lame tricks, bad CPU opponents, boring tracks really doesn't excite a person to race, and that coupled with some bad collision detection and camera problems make that miserable experience even less accessible. Snowmobiles sometimes can get stuck near the corners of objects, and the camera has a way of not moving with your vehicle when cutting a corner, often causing your snowmobile to take on damage since you're speeding into something not yet in view (and adding more damage, bills, and frustration...). There are several such blind turns in the game's tracks, too. Ten tracks are available, yet most championships are comprised of earlier courses but add in snow or rain to make it more challenging/different/less rehash-like. Sno-Cross certainly does as much as it can with the track design while keeping it a "serious" racer, but the courses still lack individuality and tend to blur together. In fact, no single aspect of the game really sticks out and makes a name for itself. Nothing about the game is particularly exciting or original, and the soundtrack fits that theme to a "T." While you're hopelessly trying to enjoy the game, you're treated to some bad rock/techno fusion. It's sad that I think I'm dating myself by referring to "techno" as a music genre, but I'd probably feel worse if I had to listen to the soundtrack some more. It's just a bland concoction of mismatched fast electronic drums and 80's synth rock that just doesn't help add any excitement to the races nor makes itself worth listening to outside of the game. The sound effects are basically limited to the muted engine sounds of the snowmobiles. Considering where these races are held, there should be a lot more sounds coming out of my speakers, but there aren't. Maybe with Sno-Cross 2. Who am I kidding? Do I even care? Even the video isn't particular worth watching, appearing rather grainy like Saturn Cinepak video. One really odd thing is how the options menu has a commercial (!?) for a snowmobile video. You'd probably be better off just buying that and watching it instead of playing this game. Better yet, just watch some snow related program on TV as long as it's not a video by that has-been rapper Sno, cause that may be only snow entertainment that's worse than this game. Even with all its modes of play, a bad game is still a bad game, no matter how many servings it offers. 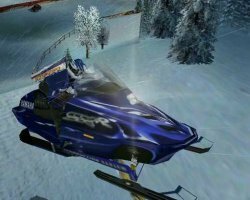 Sno-Cross is simply a bad racing game, and there's no time for bad racing games with the Dreamcast's bountiful and terrific selection. Highs: A number of different modes, real-time damage system, and the Yamaha license I guess. Lows: Graphics, camera, pop-up, music, sound effects, cheap AI, lack of fun, etc.